There I was, in the conference room setting up for a presentation. I needed sound for a clip within my Keynote presentation. They had one of those mounted overhead projectors all wired up with sound. I reached behind the Windows machine and unplugged the audio and video cables and plugged them into my MacBook. The video came up, but no sound. Beads of sweat formed on my brow as I tried in vain to get sound out of that system. The presentation was set to start in less than ten minutes and some early birds had already arrived. Read on to find out what I did. What would you think if I told you I found a speaker system for my iPod that was so small I could pop it in my pocket? Amazing, right? Yeah, that was what I thought. 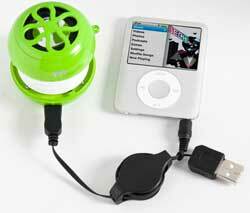 The Vibez speaker system from iFrogz is an amazingly small “hamburger” type speaker. In its closed state the Vibez is an almost round ball a little bigger than a large egg, but smaller than a tennis ball. It does fit in your pocket. You can use the Vibez in this “closed” fashion by attaching the clever self-winding cable that comes with it. This cable has an audio plug and USB connector on one end, and a mini USB connector on the other end. The mini-connector end plugs directly into the Vibez, bringing audio and power to the unit. A rechargeable battery powers the unit. The Vibez has a small switch on its side that turns the speaker on in the middle position, or when switched to the third position, boosts the audio sound output. To get more bass-response you twist the Vibez and it opens, revealing a baffled sound chamber that delivers a deeper bass experience. Let’s remember that this is a very small speaker, so the bass response is not going to give you high fidelity, but the speaker does sound remarkably rich for something so tiny. To close the unit, you simply squeeze it together, like an accordion, and twist it. Sometimes you have to play with the Vibez alignment a bit to get the unit to close. There are markings on the side, which point in the direction you need to twist to open or close it. The Vibez comes with a rechargeable battery already installed in the unit. 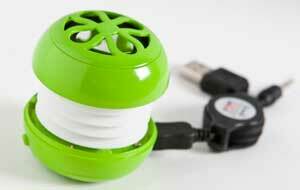 It recharges whenever it is plugged into a USB port. However, it does not have to be plugged into USB port. 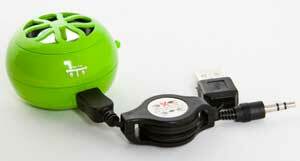 It has three tiny rubber “feet” that keep the unit from sliding, but it is very light in weight (50g). It also has a power LED on the bottom so you can tell when it’s turned on. 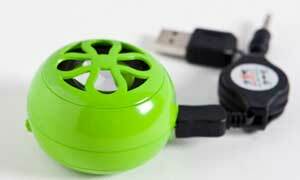 I like the clever USB charging/audio one-piece cable with retractable cable reel. The sound is very good. It’s not high fidelity with rich bass, but for the size of the Vibez and the power, it sounds quite impressive. So what happened at my conference? As I dug through my bag looking for another audio cable to try, I found the Vibez. I had dropped it in my case intending to put it through some sound trials. I fished it out and plugged it into the MacBook. Anyone who owns a MacBook knows how weak the sound volume can be. So weak in fact, that using the MacBook speakers for sound, even in a small conference room like the one I was in, was out of the question. So I plugged the Vibez in and laid it on a table in front of the podium pointed towards the dozen people who had gathered. I launched iTunes to do a sound check, and believe it or not, that little speaker was loud enough to be heard fairly well in the conference room. The folks in the room did have to be quiet, but they heard what I wanted them to hear. This probably would not have worked in a larger room, but fortunately it did work in this room. That little speaker saved my presentation that day.